The Croatian region of Dalmatia is home to the second largest city in the country, Split. 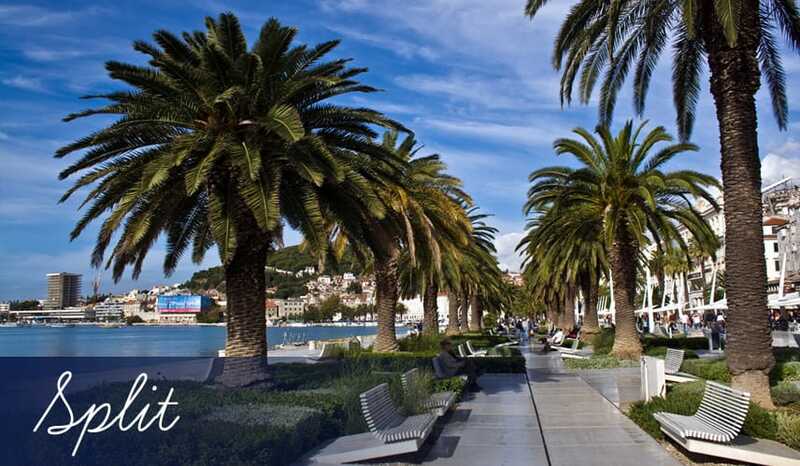 With beautiful summers and very mild winters, Split is the ideal year round holiday destination, so if you want to get away from the cold winter weather where you are, why not consider Split as your destination of choice. Enjoy some of the most impressive historic attractions in Croatia, such as the Roman Diocletian Palace, the Temple of Jupiter and the Cathedral of Saint Domnius. There are also some great museums and galleries to visit such as the Mestrovic Gallery focusing on the work of sculptor Ivan Mestrovic and the unforgettable Museum of Archaeology. There are some beautiful sand and also pebble beaches nearby when you feel like soaking up some rays or cooling off in the sea. Bacvice beach is the most popular of the many beaches here and it’s easy to see why, as it’s close to the city centre, consists of soft sand and the water is shallow for quite a way out, making it perfect for families. There is also a very active nightlife in Split, making it a good choice if that’s what you’re looking for most of all. There are many restaurants and plenty of shops, so you won’t be short of places where you can sit down for a delicious meal and window shop to your hearts content or maybe even treat yourself to something nice. Take a look at what Split has to offer to see if it would make a good choice for your next holiday abroad. If you love exploring the remains of ancient buildings then the Diocletian Palace is where you should visit first of all during Split holidays. This fascinating site marks the historic centre of the city, with many other historic buildings located around it. It was originally built as a place where Roman Emperor Diocletian could retire to but was also shared by the military, making it seem more of a fortress that a palace. This is one of the best-preserved Roman Temples on the planet and boasts a stunning vaulted ceiling with patterned stone blocks. It was built under Roman Emperor Diocletian who believed that he was the reincarnation of the highest Roman God, Jupiter. The temple is now known as St John’s Baptistery and is open to the public, so you can see it for yourself during your time in Split. As one of the oldest Roman Catholic Cathedrals in the world, the Cathedral of Saint Domnius is remarkably preserved and still in use today. It’s origin dates back to 305 AD when it was originally constructed as a Mausoleum for Roman Emperor Diocletian. As you can probably tell by now, Diocletian is responsible for most of the historic sites in Split and this is another that really can’t be missed. Considered as one of the best sculptors of the 20th century, Ivan Mestrovic is responsible for numerous masterpieces that can be seen within his gallery. Discover his works including sculptures, furniture, design, architecture and more and learn about the artist himself. As well as the Mestrovic Gallery, there are many museums throughout the city that are all within easy reach of the centre. You will find the Archaeological Museum, which is the oldest in Croatia and houses an impressive collection of prehistoric, Roman, Greek and Medieval artifacts. The City Museum of Split can be found within Diocletian’s Palace and boasts a beautiful ancient courtyard and the exhibits include weapons, coins and a stunning sculpture. If you want to find out more about the remains of this Roman Palace and the buildings that surround it, the walking tour is definitely recommended! You will be shown the most interesting parts and discover more about the history of this UNESCO World Heritage Site. A short distance from split is the Cetina River, which is a popular spot for white water rafting thanks to its second and third grade rapids, which will certainly get the adrenaline flowing! Best of all you won’t need any previous experience to take part and kids from as young as 8 can have a go! If your fitness isn’t great don’t worry, the water will do most of the work for you and if you fancy a swim there will be a few spots to stop at along the way. This is the ideal option if you want to see some of Split’s hidden areas, as you will be able to access many ore places from the water. Take a trip around the Marjan peninsula, visiting hidden coves and enjoying the stunning views along the way. You can go at your own pace and it’s a great way to get used to the water, so beginners are more than welcome. There are plenty of sailing charters available in Split, so if you love nothing more than getting out onto open water and travelling along the coast then you will have plenty of chances to do so. If you’re a confident sailor then the sailboats will be perfect for you but if you would rather not have to worry about sails, there are plenty of motorboats also available for charter. If you fancy learning something new during your time in Split why not visit the local PADI certified dive centre and learn how to scuba dive! This will allow you to experience an unforgettable adventure beneath the sea but if you don’t like the idea of getting too deep, you can always try snorkeling on one of the local boat trips. Unlike the rocky shores of Dubrovnik, Split has an impressive selection of sandy beaches close to the city centre, so you won’t have to travel very far at all to enjoy a relaxing day on the sand. This stunning Blue Flag beach is only a short walk from the centre of the city, so it won’t take long for you to get from historic surroundings to soft sand and blue sea. It can get rather crowded during the summer months but there’s always a space to be had, so won’t need to travel anywhere else. There are lifeguards, showers, drinkable water and plenty of places to grab a drink and a snack. The next bay along from Bacvice is where you will find Ovcice Beach, which consists of small pebbles. Don’t let this put you off, as there are beach chairs available for hire and it’s still comfortable under bare feet. For the smaller kids in the group there is a playground and also showers if you need to rinse off after a swim. The next stop during our tour of Split’s beaches should definitely be Firule Beach. Here you will be back to enjoying soft sand, so you won’t have any hesitation lying straight down without the aid of a beach chair. It’s great for families, as the water is shallow and there is also a shower and a place to grab a drink. If you don’t mind heading a little further away from the city, why not journey to Trstenik Beach, which is approximately 4km away. This pebble beach has some great facilities including showers, bars and changing rooms, as well as beach chairs so you can stay off the pebbles. Other beaches in the area include Kastelet Beach, Znjan Beach, Jezinac Beach. Exploring the streets of the city and trying out the activities will no doubt give you an appetite that can’t be ignored, so it’s best that you satisfy it as soon as possible. Thankfully, there will be plenty of places to do this, as Split is filled with excellent restaurants varying in price, style and dish. Fancy some Balkan cuisine? Then head to Villa Spiza where you can enjoy freshly prepared dishes including risotto. This lovely restaurant can be found within the walls of the palace and will no doubt become a favourite once you’ve visited it. Pimpinella is another excellent place for Balkan cuisine and so is Bajamont and Kod Joze. These may be small and relatively off the map but they are well worth tracking down to enjoy a traditional taste. A trip to Split wouldn’t be complete without sampling some of the supremely fresh seafood incorporated into the local seafood dishes. Sperun is a lovely restaurant where you can taste fresh seafood dishes and best of all is surprisingly cheap compared to the more pricey restaurants in town. For international cuisine visit Figa and enjoy the funky interior and bar. It’s a great place for meals throughout the day whether you want a tasty breakfast to get you going, a light lunch or a filling evening meal, it’s makes a great place for all. Fancy a pizza? Then head over to Galija, the top spot for pizzas in Split. Split should definitely be on your top places to party list, thanks to its selection of entertaining bars and clubs. Like most clubbing destinations, the best time to visit for nightlife is during the summer, so make sure you visit during this time to experience the best shows and entertainment the city has to offer. If you love partying well into the next morning, you’re in luck, as the ‘normal’ time for those to enter the clubs is around 1am, as apposed to the earlier times we’re used to. Wherever you are located in Split, you won’t be far from a club or bar, as there are many throughout the city from the very centre to the beaches. Hemingway is one of the most popular clubs in the city and boasts its very own swimming pool! There is also the Tropic Club Equador, which boasts a fun Latin theme and Imperium is also a top venue for those looking for an awesome time with DJ’s playing some awesome sets. Gaga, Ghetto and Plus are a few more examples of excellent venues that are worth including on your tour of the nightlife. Continue your tour by stopping off at clubs including O Hara and Quasimodo is a popular spot for those who fancy the alternative types of music. It’s probably safe to say that the majority of us love to shop during our holidays, which is why you will be happy to hear there are many shopping opportunities for you to take advantage of in Split. The main shopping area can be found around Diocletian’s Palace and from there you will find stalls and stores selling all kinds of goods from souvenirs to high street fashion. If you love walking around shopping malls there are plenty of those to close to the city. Around five kilometres from the centre of the city is Mercator, a large shopping mall that consists of a number of smaller shops and also a large supermarket, which is ideal if you will need to do food shopping. A little further away is the Emmeziea shopping mall. Here you will get to browse approximately 40+ shops ranging from clothing outlets to restaurants, cafes and sports goods stores. It is also a great place for food shopping thanks to the large supermarket located here. Even if you’re on an all inclusive holiday, it may still be worth buying snacks and drinks. The latest addition to the shopping malls near split is the joker Centre. As well as a supermarket, the centre offers fifty shops, an open-air restaurant, a pool and a cinema where you can catch the latest releases. It’s a major shopping mall and well worth checking out during your shopping days.